1. The iconic “bark” of the velociraptors was made by using the sound of mating tortoises. Other animal sounds used for the raptors included a horse’s breathing and the hiss of an angry goose. 2. The T. rex was not supposed to break the glass on the Ford Explorer. The breaking of the Ford Explorer’s sunroof was a complete accident, but resulted in some genuine screams from Joseph Mazzello (Tim) and Ariana Richards (Lex). 3. One of the film’s most suspenseful moments was created by strumming a guitar string. Before it makes its first appearance, the T. rex’s presence is felt through a plastic cup of water, which shakes as it gets closer. To create this effect, a guitar string was attached under the dashboard beneath the glass. The string was then plucked in a similar pattern to the T. rex’s footsteps. 4. Steven Spielberg purchased the film rights to Jurassic Park six months before it was published. While developing the screenplay for ER with Michael Crichton, Spielberg found out about Crichton’s plans to write Jurassic Park. Immediately after, Spielberg influenced Universal to purchase the film rights. 5. And the decision to have Richard Kiley provide the voiceover in the park vehicles was made in Crichton’s novel. In Crichton’s story, he specifically mentions that the Jurassic Park audio tour is narrated by Golden Globe-winning actor Richard Kiley. So of course Spielberg hired Kiley to provide the voiceover in the movie adaptation. 6. Plus Crichton’s novel even provided an explanation as to why the triceratops was sick. In the original book, we find out that the stones the triceratops (a stegosaurus in the novel) ate to help aid its digestion were located near poisonous West Indian lilac berries, which made it ill.
7. Jim Carrey was considered for the role of Dr Ian Malcolm. Although Jeff Goldblum was tipped for the role, several other actors, including Jim Carrey, auditioned. And according to casting director Janet Hirshenson, he did pretty well, too. 8. The helicopter scene foreshadows a very important part of the film’s plot. In the scene, Dr Alan Grant (Sam Neill) fashions a functioning seatbelt with only two latches and no latch plate. This foreshadows a later scene where the dinosaurs are suddenly able to breed despite all originally being female. 9. There’s only 15 minutes of actual dinosaur footage in the final cut of Jurassic Park. And that’s in comparison to the film’s running length of 127 minutes. 10. Spielberg received $250 million from Jurassic Park. Including gross and profit participations as well as merchandise, Spielberg’s sum remains the largest amount any one individual has made from a film. 11. And Jurassic Park earned $357 million in North America, and a total of $914 million worldwide. 12. Sam Neill injured himself with a flare while filming. The injury took place during the scene in which Grant uses the flare to distract the T. rex. According to Neill: “It [the flare] dropped some burning phosphorous on me, got under my watch, and took a chunk of my arm out. 13. Ariana Richards won her role by screaming the loudest. To cast the character of Lex, Spielberg auditioned a number of girls and asked them to record their screams. Richards’ on-tape scream was the only one loud enough to awaken Kate Capshaw (Spielberg’s wife) and send her running down the hall to see if her children were alright. 14. And the casting of Joseph Mazzello led to Spielberg switching the ages of Lex and Tim. Initially Mazzello screen-tested for Hook, but he was turned away by Spielberg for being too young. Promising to get him in a movie that summer, the director then cast 9-year-old Mazzello as Tim in Jurassic Park. This proved slightly problematic, as in the original novel Tim is the older sibling. And since Spielberg refused to cast someone so young for the character of Lex, the decision was made to switch their ages. 15. The 3D Unix interface that Lex uses to reboot the park’s power is actually a real program. Even though it looks fake, the Unix system seen in the film is a real 3D file management browser called Fsn (Fusion) that was released in the 1990s by Silicon Graphics. 16. Plus there’s a slight technological slip-up when Nedry is communicating with the dock via webcam. If you look closely, Nedry’s communication link to the dock is actually just a QuickTime video playing on screen. You can even see the time bar moving along the bottom of the screen as it plays. 17. A crew member almost died while they were building the animatronic T. rex. Prior to filming, the T. rex animatronic had to be enclosed in foam rubber that would resemble the dinosaur’s skin. According to Alan Scott, one of Jurassic Park’s mechanical designers, there was a whole section in the middle that could only be reached by crawling into the animatronic while it was powered up in a particular position. If the power went off for any reason, the head of the T-Rex would move and cause all of the hydraulic cylinders and sheets of metal inside to be in the pathway of the crew member’s body. As luck would have it, the power went off in the entire studio while Scott was inside working. But fortunately he was able to avoid all the moving metal parts and escaped unscathed. 18. To ensure that all the actors had the same reaction times, Spielberg would make his own dinosaur sounds. According to Laura Dern, the sight of Spielberg making roaring dinosaur noises through a bullhorn became commonplace while filming. The only problem was the actors trying not to laugh in response. 19. The idea to have Mr DNA explain the science behind Jurassic Park was the result of a sarcastic comment. 20. There’s no evidence to suggest that the dilophosaurus was venomous or had a frill. The dilophosaurus was also significantly scaled down in the film so that the audience wouldn’t confuse it with the velociraptors. 21. 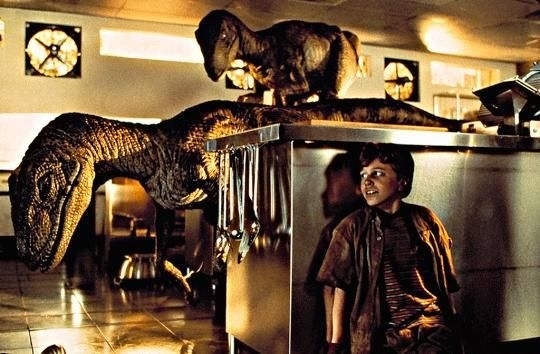 The hungry raptors in the kitchen scene were played by special effects designers in elaborate costumes. 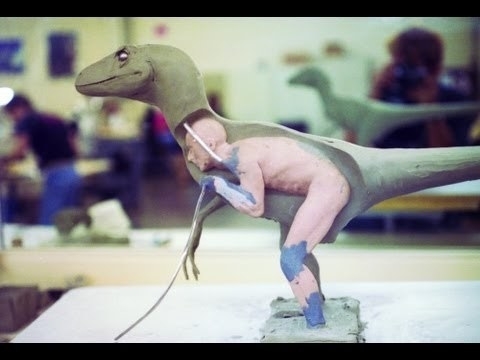 The suits were designed by placing raptor drawings over various images of a designer, followed up by a body cast and a full sculpture of the final form. To fit inside the suit, the designer had to bend over, in a pose similar to that of a skier, for up to four hours at a time during filming. 22. And while filming, the T. rex was nothing more than a man waving a long stick with a drawing of the dinosaur’s head attached. While the first T. rex scene used a mixture of animatronics and CGI, the ending required the dinosaur to be completely designed on a computer. So the actors would know what they were screaming at, the crew built what Spielberg called “barber poles”, which were the long poles with a T. rex face attached to them. 23. The last few days of shooting were disrupted by one of the strongest and most destructive hurricanes to hit Hawaii. On the last day of shooting, Hurricane Iniki made landfall at the film’s central location of Kauai. Funnily enough, while most of the 130-strong cast and crew waited out the storm in their hotel, Richard Attenborough slept soundly through the whole ordeal. 24. Jeff Goldblum and Laura Dern began a romantic relationship after meeting on set. The two sweethearts also got engaged after Jurassic Park, and they stayed together for two years before eventually splitting up. 25. Spielberg and Crichton saw themselves represented in the characters of Hammond and Malcolm. Spielberg saw many parallels to himself in Hammond’s desire to dream of bigger and better things. On the other hand, Crichton said that his views on science and genetic engineering were largely reflected by Malcolm’s voice of reasoning. Their diametrically opposed views are also shown by the contrast of Hammond’s all-white attire and Malcolm’s black outfits. 26. There’s a subtle reference to another one of Spielberg’s blockbusters hidden in Jurassic Park. If you look closely during Nedry’s argument with Hammond, you can just make out Jaws playing on one of the computer screens. 27. Spielberg decided to change the ending with just a few weeks left of production. The original ending had one of the raptors killed after getting stuck in a T. rex skeleton that crashes to the ground. But after seeing the success of the T. rex sequences, Spielberg was inspired to bring back the gigantic dinosaur for one last heroic appearance.